We all struggle to know ourselves in a profound way; some more than others. But with some simple steps and the development of good reflective habits, you can come to know yourself in a meaningful way that helps you get the most out of your life. If you are struggling to find your way, it might time to sit down and start making sense of your life as it was, as it is, and as it will be. Here is a guide to help you find out who you really are in the world. In order to get where you are going, you need to learn more about where you have been. The past can be painful for a lot of people, but it is an important part of discovering who you really are in the world. Take some time to create a timeline of where you have been in the world, who you have shared experiences with, and how those experiences and places have left a mark on your life. You might find that these were not positive experiences, but if you are willing to sit with the discomfort of exploring them and revisiting them, you’ll find strength and confidence to go forward for further exploration and understanding. This exercise isn’t about wallowing in self-pity. It’s about understanding what you’ve learned about yourself from these experiences. Our struggles, tribulations, and experiences make us who we are. Reminding ourselves of the hard times we have been through gives us courage and strength. 2) Acknowledge what makes you different. On your path to discovering who you really are in the world, it will be important that you take time to identify and celebrate what makes you, you. What makes you different from everyone else on the planet? It’s hard to tell sometimes, especially because we are often so critical of ourselves in comparison to other people. But rather than feeling weighed down by your differences, celebrate them and put them front and center in your exploration of yourself. If you allow yourself to be happy about who you are, you’ll find that you are much happier in all areas of your life. A practical exercise to find out what your unique characteristics are is to list down 10 traits about yourself that you’re proud of. This could be your kindness, your loyalty, or the fact that you’re skilled at knitting! Before you can do any kind of work on your future self you need to reconcile who you are right now. It’s easy to discount the good things you think about yourself and let the negative thoughts take over. But understanding what your positive traits are and what makes you unique will help you banish the negativity and accept yourself. And if you’re going to find yourself, you need to accept who you are right now. Change, whatever that might look like for you, is really going to come from a place of understanding and love. 3) Find new ways of being. Rather than continue to do the same old things and expect to find new things about yourself, set yourself up for discovery success by trying to live your life in new and intentional ways. Be present when people talk to you. Be curious about what is around you. Ask yourself questions about why you are the way you are and be ready to be confronted by answers you might not like. It’s all part of the growing process to help you find who you really are. Once you confront things you don’t like about yourself, it is easier to point out the things you do like and focus on making them part of your new ways of being. And in the end, fully embracing your weaknesses is the only way to improve them. And being honest about what they are will allow you to adjust your life, which will create opportunities for growth. 4) Identify what brings joy to your life. When it comes to finding your way in the world and knowing who you really are, you’ll need to figure out what really makes you feel alive. Put yourself in front of things that make you feel good as often as possible and focus on the good instead of the bad. There is room for the good and the bad in our lives, and there will be time to explore the things that make you feel less-than-ideal. But when you are trying to find your best life, the good is what gets your attention. Making sense of who you really are is about being okay with the bad but lifting up the good. At what moments do you feel most alive? When you discover what ignites your soul and makes you happy, you can engineer your life to produce those moments more often. 5) Understand what gives you power in the world. In order to find your place in life, you need to understand the power you have within you to make change happen and last for a long time. We all have the courage and opportunity to make a change; we just have to be willing to go after it. When we tap into our power, we are unstoppable and we can design the lives we really want. If you want to find out who you really are, tap into the power inside you and use it as often as possible to challenge situations, people, and opportunities. 6) Forgive your critical side. It’s important that you let go of your critical side when you are looking for ways to live your best life. Critical comments of yourself don’t help you grow. It is different than critical reflection, which is not critical at all, but exploratory. You can’t grow from a place of hate. Find out who you are by being kind to yourself along the way. Most of us are inherently negative. We have about 65,000 thoughts every day, and shockingly, 70 percent of them are negative. But problems start to arise when we believe our thoughts, or we identify with our thoughts. How do we rise above our thoughts and not be so attached to them? Once you stop identifying with your mind, you can live in the present moment. And as Eckhart Tolle says, it’s in the present moment that you can find out who you really are. 8) Don’t be afraid to speak your mind. Stand up for what you believe in and let others know what you think. You don’t have to belittle other people to make yourself feel good. Rather than try to get everyone on your side, be comfortable in taking a stand on your own and settle into a routine of being open to hearing other people but accepting of your own beliefs. To stand up for what you believe in, you need to accept that at times, you’re going to be vulnerable. But one of the best ways to get to know your real self is to allow yourself to be vulnerable in the face of others. If you are wrong, say you are wrong. If you believe something wholeheartedly, say that. If you are worried or have questions, allow yourself to look for the help you need. When you are vulnerable and real, people will see that. This reinforces your own thoughts about yourself and makes you feel comfortable in the presence of others. There’s certainly a place for introspection, but if we focus on ourselves too much, we can become self-centered. We can get lost in our own minds and our own problems. But when you forget about yourself and your problems, and you focus on helping others, you gain a better perspective on life. You realize that you’re not the center of the universe. There’s a beautiful world out there waiting for you to open your mind to. As The Dalai Lama says below, if we think only of ourselves, then our minds occupy a very small area. If you’ve been through the steps above, you’ve probably come to a point where you’re understanding yourself better. You’ve got a better idea of who you are, what makes you happy, and what you can offer to the world. Once you’ve decided who you are and most importantly, who you’re going to be, it’s now time to start doing it. The biggest test of character is doing what you’ll say you’ll do. Over the past few decades, scientists have grown increasingly interested in happiness: What makes us happy or unhappy? How can we increase our happiness? Recent research indicates that Buddhism has an incredible amount to teach us about living happier and more satisfying lives. 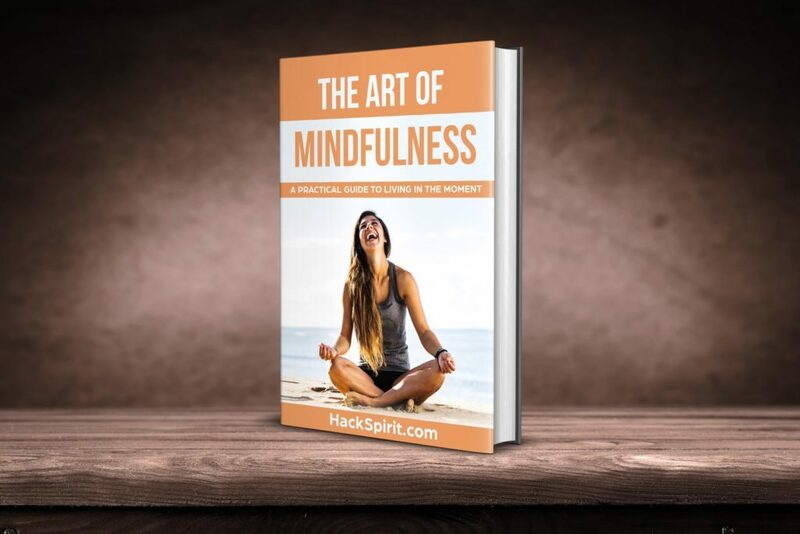 By unwrapping iconic Buddhist teachings, our new practical, evidence-based eBook details specific actions you can take to dramatically improve your everyday life. Check it out here.